John Basilone was born on November 4, 1916, in Buffalo, New York, the sixth of Salvatore and Dora Basilone's ten children. The family eventually settled in Raritan, New Jersey, where John grew up. At the age of 15, John dropped out of school and worked as a caddy at a local golf club for a couple years until deciding to enroll in the US Army in 1934, at the age of 17. Basilone was initially assigned to the 16th infantry at Fort Jay, New York and, after his initial discharge, he reenlisted the next day and was assigned to the 31st Infantry and stationed in Manila, Philippines. After leaving the Army in 1939, Basilone worked as a truck driver for a few months before deciding to enlist in the Marine Corps. Basilone was initially stationed in Guantanamo Bay, Cuba but following the bombing of Pearl Harbor and America's introduction to WWII in December of 1941, he headed to the Pacific Campaign as a member of the 1st Battalion 7th Marines. In August of 1942, US Marines landed on the island of Guadalcanal in the Solomon Islands and captured an airfield that would be called Henderson Field. For the next two months, American and Japanese forces engaged in a series of air battles over the island while Japanese forces on the island regrouped in the jungle and planned a counter-attack to retake the airfield. In late October, a force of roughly 20,000 Japanese soldiers launched an attack on a comparably-seized force of American Marines and soldiers defending the airfield. 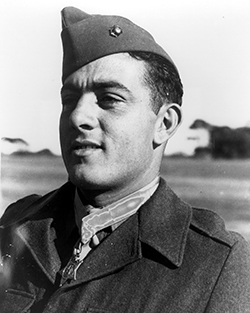 During the battle, John Basilone's unit came under attack by a regiment comprised of roughly 3,000 Japanese soldiers. For the next three days, without food or sleep, Basilone and his comrades fought off the Japanese forces until reinforcements arrived, with only two men other than Basilone surviving. At one point, Basilone had to single-handedly fight his way 150 yards through Japanese lines to get more ammunition and continue the fight and, by the time the engagement was over, he had killed at least 38 Japanese soldiers. For his actions on Guadalcanal, Basilone was awarded the Medal of Honor. In 1943, Basilone returned to the United States to participate in the war bond tours to raise money for the war effort. During the tour, Basilone requested to return to the front but his request was denied as the Marine Corps felt that he was needed on the home front. Basilone was then offered a commission, followed by an instructor's role, both of which he turned down, before requesting to return to the front again, a request that was approved this time. Toward the end of 1943, Basilone went to Camp Pendleton, California, where he met Lena Mae Riggi, a Sergeant in the Marine Corps Women's Reserve, who he would go on to marry in July of 1944. Following his marriage, Basilone requested to return to fighting in the Pacific Theater, a request that was approved. He was assigned to Charlie Company, 1st Battalion, 27th Marine Regiment, 5th Marine Division for the invasion of Iwo Jima. During the invasion, Basilone was serving as a machine gun section leader on Red Beach II. As his unit came under heavy fire from fortified blockhouses, Basilone maneuvered himself onto the top on one of the blockhouses, before destroying it with grenades and demolitions. He then fought his way to aid a disabled American tank that was trapped in a Japanese minefield under intense mortar and artillery fire. Basilone guided the tank to safety before being killed by shrapnel from a Japanese mortar. For these actions, Sergeant John Basilone was awarded the Navy Cross. Sergeant John Basilone's legacy is one of the most expansive and visible in Marine Corps history. The USS Basilone, a Gearing-class destroyer sponsored by Basilone's wife Lena, was laid down and luanched in 1945 and commissioned in 1949. On Camp Pendelton, there is an entry point to the base from Interstate 5 called "Basilone Road." Additionally, part of Interstate 5 running through the base is called "Gunnery Sergeant John Basilone Memorial Highway", and a parachute landing zone on the base is named "Basilone Drop Zone". In his hometown of Raritan, New Jersey, the highschool football field is named after Sergeant Basilone, as are the local Knights of Columbus Council, a bridge over the Raritan River, and an overpass at Somerville Cirlce in Somerville, New Jersey. Additionally, there is a statue of Basilone holding a machine gun in Raritan, a plaque at the United States Navy Memorial in Washington, D.C., a bust in San Diego's Little Italy (in an area called Basilone Plaza). Since 1981, Raritan, New Jersey has hosted an annual parade in Basilone's honor, and in 2005, the U.S. Postal Service issued the "Distinguished Marines" stamps honoring four Marine Corps heroes including Sergeant Basilone. —Sergeant John Basilone (USMC photo). 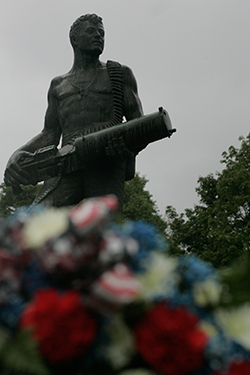 One of the many wreaths placed in front of the John Basilone Statue in Raritan, N.J., September 27, 2009. The celebration of the town's Medal of Honor recipient is the largest military parade in the nation. 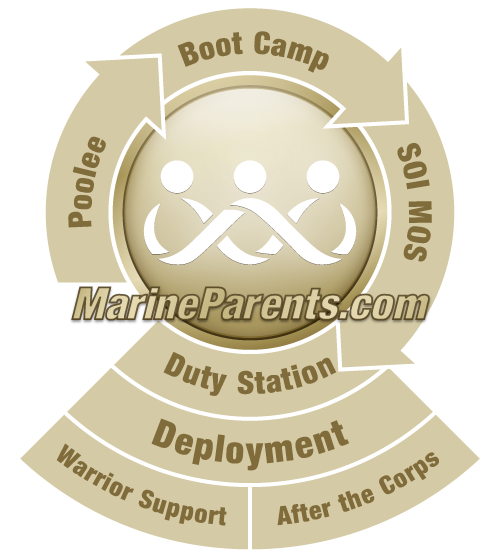 —USMC photo by Sergeant Randall A. Clinton. 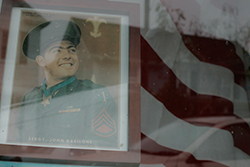 A storefront displays a picture of Sergeant John Basilone along with an American Flag in Raritan, N.J., September 27, 2009. This 7,000-person town hosts the largest military parade in the nation and one of the only in tribute to an enlisted Marine. 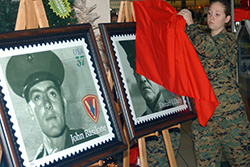 Distinguished Marines stamps, which bare the faces of four legendary Marines, were unveiled at a ceremony at Camp Pendleton's Paige Fieldhouse November 10, 2005. The stamps commemorate Daniel J. Daly, John Basilone, John A. Lejeune, and Lewis "Chesty" Puller for serving their country with bravery and distinction during the 20th Century. The stamps took ten years to develop. —USMC photo by Lance Corporal Ray Lewis. For extraordinary heroism while serving as a Leader of a Machine-Gun Section, Company C, 1st Battalion, 27th Marines, 5th Marine Division, in action against enemy Japanese forces on Iwo Jima in the Volcano Islands, 19 February 1945. Shrewdly gauging the tactical situation shortly after landing when his company's advance was held up by the concentrated fire of a heavily fortified Japanese blockhouse, Gunnery Sergeant BASILONE boldly defied the smashing bombardment of heavy caliber fire to work his way around the flank and up to a position directly on top of the blockhouse and then, attacking with grenades and demolitions, single handedly destroyed the entire hostile strong point and its defending garrison. Consistently daring and aggressive as he fought his way over the battle-torn beach and up the sloping, gun-studded terraces toward Airfield Number 1, he repeatedly exposed himself to the blasting fury of exploding shells and later in the day coolly proceeded to the aid of a friendly tank which had been trapped in an enemy mine field under intense mortar and artillery barrages, skillfully guiding the heavy vehicle over the hazardous terrain to safety, despite the overwhelming volume of hostile fire. In the forefront of the assault at all times, he pushed forward with dauntless courage and iron determination until, moving upon the edge of the airfield, he fell, instantly killed by a bursting mortar shell. Stouthearted and indomitable, Gunnery Sergeant BASILONE, by his intrepid initiative, outstanding skill, and valiant spirit of self-sacrifice in the face of the fanatic opposition, contributed materially to the advance of his company during the early critical period of the assault, and his unwavering devotion to duty throughout the bitter conflict was an inspiration to his comrades and reflects the highest credit upon Gunnery Sergeant BASILONE and the United States Naval Service. He gallantly gave his life in the service of his country.